We can accomodate most fonts for your lettering, BUT YOU HAVE TO TELL ME THE NAME OF THE FONT! We have a place for "OTHER FONT"...THAT DOES NOT MEAN YOU SAY, "SEE ARTWORK". Scanning the lettering into the program produces the lowest quality lettering. Typing it in manually is faster and creates a much better product....SO PLEASE TELL ME THE FONT. If your font is a secret and telling me the name of the font would compromise NATIONAL SECURITY, then we are probably not the place to have your patches made. If you just don't know, that's fine.....but tell me you don't know. If I can't find it, I may be able to find something close. For the most part, we can use most of the fonts you can find on the internet. We normally send people to www.DaFont.com . That site for the most part, don't have viruses in the downloads and have a good assortment of fonts for you to use. If you are wanting a small patch, you should stay clear of the fonts that have outlines or really thin areas. 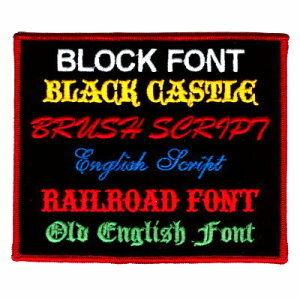 If you are lettering a back patch, I can use most any of them. I have a few of the most popular fonts listed in the items and well as shown below. There is also a choice for "Other Font" with a box for you to list the name of the font. Be sure to write all the name as listed on the dafont site. It makes things much easier. These are a few of the custom patch fonts.